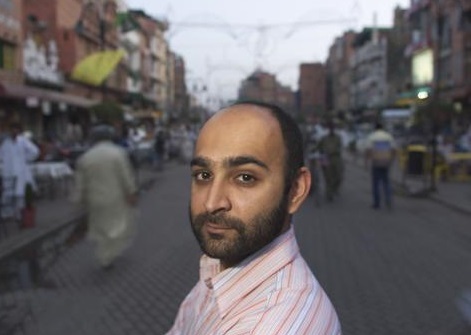 Thursday, March 8, 2018 -- Sometimes big surprises come in little packages and we have irrevocable proof of this adage in Exit West, the realistic yet otherworldly novel by Mohsin Hamid, a 46-year-old Pakistani writer. Seemingly out of nowhere, Hamid has earned a place on numerous "best book" lists, as well as being short-listed for several top awards. All for this slender 2017 work of a little more than 200 pages. Exit West is the mystical journey of the gentle and conservative Saeed and the bold and independent Nadia, an unmarried young immigrant couple. They begin in a never-identified Middle Eastern community and flee their war-torn homeland for various destinations that are the new home to thousands of other refugees from all over the globe. The various émigrés are transported, passing from one overcrowded and misery-riddled encampment to another, through a series of magical doors. A sense of emotional strain and both seen and unseen threats permeate the places they arrive. The refugees, it should be noted, cannot choose where they want to go. They end up only where the doors deliver them, including Auckland, Madrid, Amsterdam, Mykonos, Vienna, Abu Dhabi, London or a surprisingly unfamiliar Marin County near San Francisco. What we experience in the pages of Exit West is elemental insight into the daily life of millions of immigrants in our fractious and hostile world. Hamid masterfully showcases the myriad challenges that displacement poses to one's identity and humanity at the most basic level. Consider this passage describing the importance of a shower and clean clothes to Nadia: "It was for her not about frivolity. It was ... essential, about being human, about living as a human being." Although their lives improve a bit as they progress through multiple doors, the threat of violence is constant. The danger comes both from those within the refugee camps--some of whom may be enemies from their native land--and the backlash from nativists who want them out of their cities. The air of desperation and displacement never truly lifts for Saeed and Nadia or the other refugees in Hamid's tale. But there is a sense of connection. As the author astutely observes: "We are all migrants through time." Exit West unfolds with gentle, rhythmic prose that both enchants and informs. This is despite the grim nature of this timely work and the often tense adventures that the young couple encounter in their almost Biblical wanderings. This is fairytale stuff to some extent, which would render the tale simplistic and possibly unsatisfying, but the author has a way of presenting his stories that is both compelling and sensitive. What I'm trying to say is that this guy can really write. On being uprooted, for example: "We murder from our lives those we leave behind." The few hours it takes to enjoy Exit West seem to flow by as the journeys unfold. Hamid has a skillful way with the English language so it is not surprising that the novelist has earned praise from both critics and readers. And he already has a growing collection of fiction. Prior works include Moth Smoke, The Reluctant Fundamentalist and a book of essays, Discontent and Its Civilizations. This column is Copyright © 2018 by Martin B. Deutsch. JoeSentMe.com is Copyright © 2018 by Joe Brancatelli. All rights reserved. All of the opinions and material in this column are the sole property and responsibility of Martin B. Deutsch. This material may not be reproduced in any form without his express written permission.